" Abbreviations: BETAX, betaxolol; NE, norepinephrine; PRAZ, prazosin; E, epinephrine; OXY, oxymetazoline; YOH, Yohimbine. Reproduced from Lomasney, J. W., Allen, L. F., and Lefkowitz, R. J. (1995). Cloning and regulation of catecholamine receptor genes. In "Molecular Endocrinology" (B. D. Weintraub, ed. ), pp. 115-131. Raven, New York. FIGURE 11-10 Topology-functional domains of the /^-adrenergic receptor. Structural features of the jiT adrenergic receptor as a model for the functional domains of G-protein-coupled receptors. Regions depicted are involved in ligand binding, G-protein coupling, and regulation by kinases. Abbreviations: /3ARK, ji-adrenergic receptor kinase; PKA, protein kinase A. Reproduced from Lomasney, J. W., Allen, L. F., and Lefkowitz, R. J. (1995). Cloning and regulation of catecholamine receptor genes. In "Molecular Endocrinology" (B. D. Weintraub, ed. ), pp. 115-13). Raven Press, New York. The /3-receptor is a membrane site that acts to increase the rate of adenylate cyclase activity on the cyto-solic side, producing stimulation in the level of intracellular cyclic AMP (see Chapter 1). The /3-receptors of the heart have been classified as -adrenergic receptors, and the other receptors are classified as /32-adrenergic receptors. Epinephrine and norepinephrine bind equally well to the /Vreceptor, whereas epinephrine is about a 10-fold better ligand than norepinephrine for the /^-receptor. 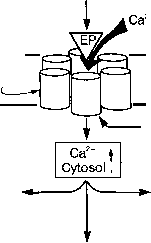 Figure 11-13) and operates by altering the flux of Ca2+ within the cell. The a,-receptors refer to postsynaptic receptors or those located on effector cells and have a great affinity for the antagonist prazosin (Table 114). The a2-receptors refer to the presynaptic receptors, although apparently it is still unclear whether a2-receptors actually are located on nerve terminals. 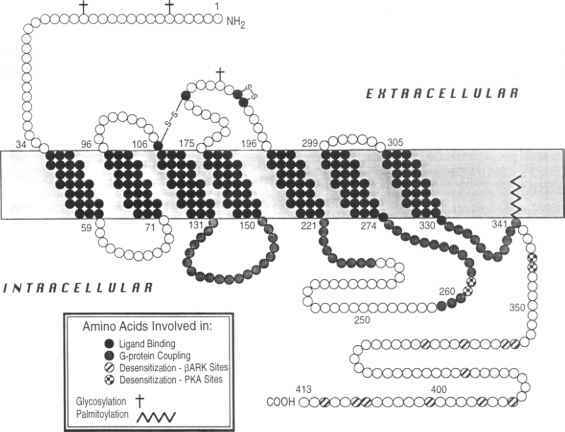 They may also refer to postsynaptic effects that are coupled to adenylate cyclase in an inhibitory way, resulting in a lowering of intracellular cyclic AMP levels.